July 30th, 2006: We’re home again! And glad to be here, though we just had one of the best trips we can remember. Some kind neighbour had mowed our lawn recently so I wasn’t faced with that task right off the bat. The boulevard has been mowed, too - must have been the Park as it looks uniform all the way along. 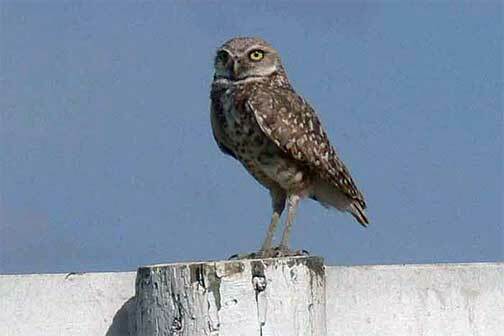 South of Sceptre, Doreen spotted a burrowing owl at the edge of the road. We did a fast, highly illegal turn, and went back. The owl flew before I could take a photo, but it landed on a signpost not far away. I managed to get close enough for a few shots. First time we have ever seen one, and are they cute! Then we got to the Great Sand Hills and parked to view the dunes. Wow! They must be 200 feet high or more! 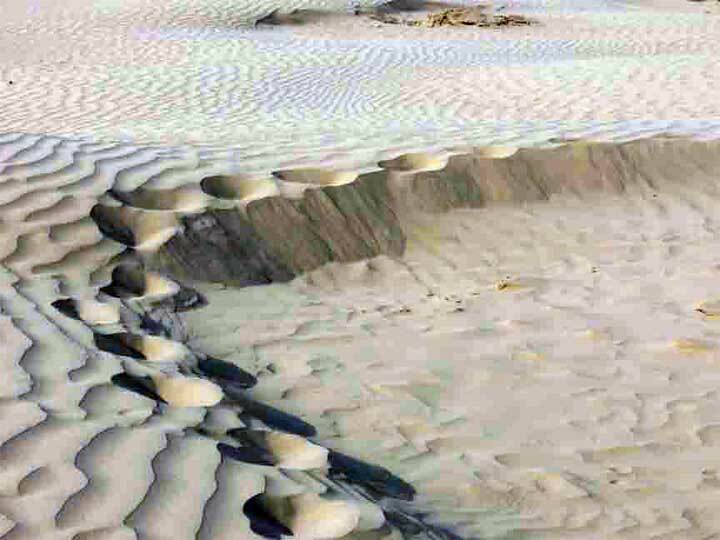 The sand at the top has some texture to it, but on the steep slopes it is like talcum powder. I have dreamed for years of seeing the sand dunes - a photographer’s paradise! Then we went south, again over a gravel road that had so much loose gravel it kept our speed down well below 80 kmh. 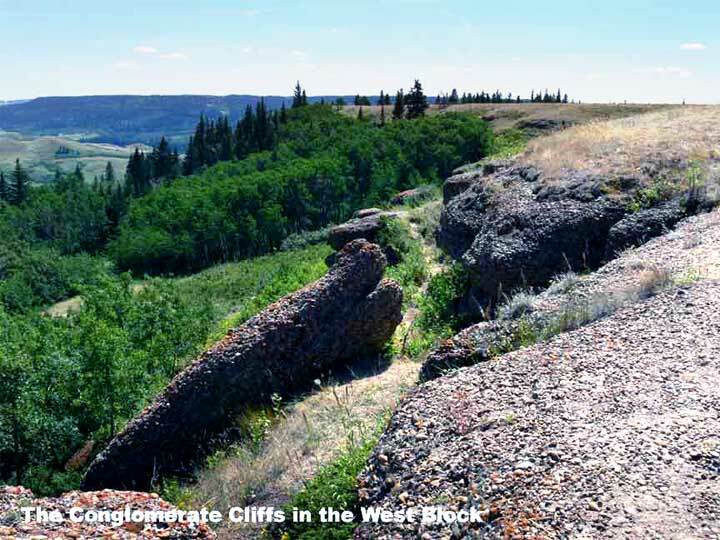 Highways 13 and 21 to Consul weren’t much better – it looked as if they were once paved and had been graveled over. Somewhere Doreen had picked up a pamphlet on a SW Quest, which turned out to be a self-guided tour similar to the Artisan’s Tour we had taken in June. We spent two days at it, staying one night in Consul and one in Eastend, and had a ball. 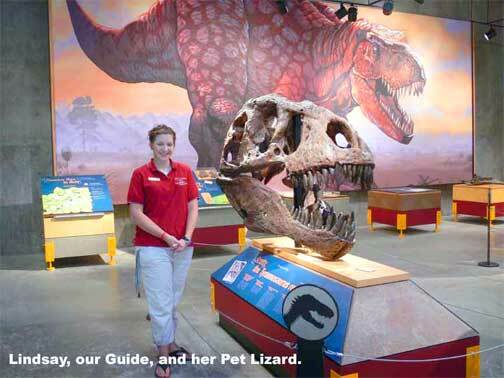 There were guest houses, art galleries, historic places, a museum, and the T. rex Discovery Center at Eastend, which was awesome. One man balanced rocks, one on top of another, then photographed them or drew them in pointillism. The same man did some excellent clay sculptures, too. There were potters, photographers and sculptors. Everyone was warm and friendly, and happy to visit. We made our way through Shaunavon and Gravelbourg to Moose Jaw, where we toured the Sukanen Ship Museum in 35° sunshine. Something else we have wanted to see for years. 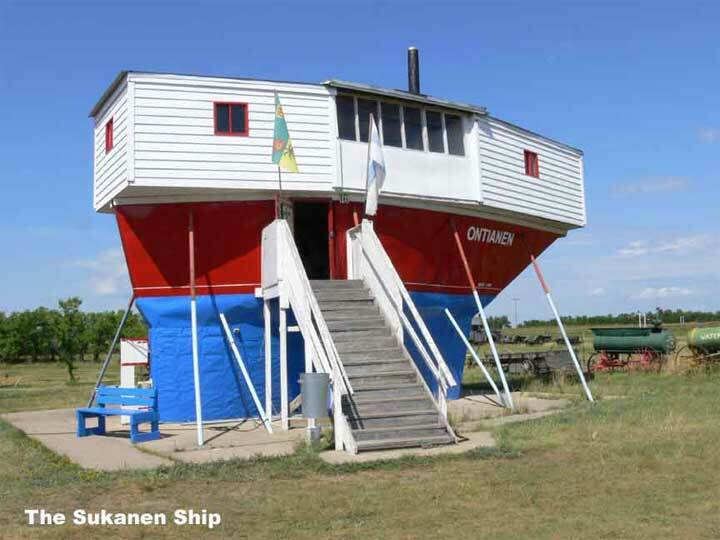 Sukanen was a homesick Finn who made a ship to sail back to Finland via the Saskatchewan River. Unfortunately, he was committed to a mental hospital before he got finished, and died there. He was also an inventor, and there was a display of some of his inventions. There is also a historic village with all the usual – general store, school, church, blacksmith ship, etc. An excellent stop! 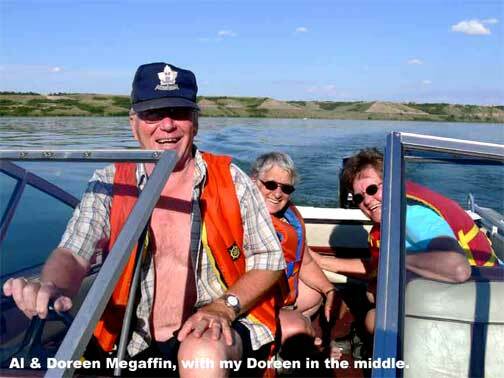 Then we went to Regina Beach where we spent two days visiting good friends from our Wynyard days, Al and Doreen Megaffin. What a wonderful visit! We had a boat tour of the south end of the lake, at fish and chips at the Bluebird Café, and sat around a campfire, visiting for hours. Not to mention walking my legs off when Al got us lost! Last feature was a stop at Craik where we watched a straw house under construction, and visited the Craik Sustainable Living Project. That is a restaurant, gift shop, meeting rooms, and golf club house. 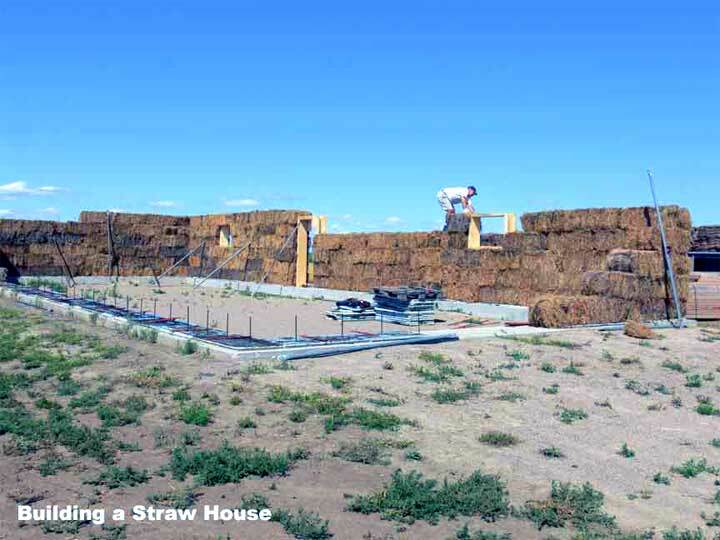 The building has straw walls; passive and solar heat as well as geo-thermal heating and cooling. All the lumber used in construction and to make the tables and chairs, came from demolished elevators. Well worth seeing, and their rhubarb pie is the kind Mother wished she could make! We bought a metal sculpture at their gift shop. 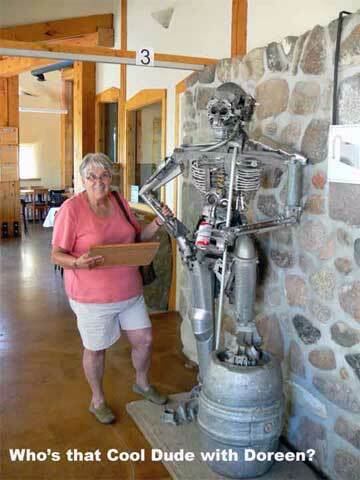 It is made by a man from Craik; he had many other great sculptures there, too, including a life-sized alien. 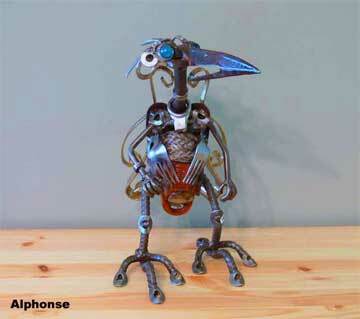 We call our sculpture Alphonse. We spent the night at Nokomis campground, but we didn’t stop at the museum - too close to home! Lots of stuff going on here at the Park that I wasn’t able to tell you about before - Rose Steadman had a Fun Day at the Park Store yesterday with draws and special events for Mini-Golf and Mallet Pool. The Park had a Tethered Balloon Ride at the Golf Course Friday evening and I understand there were an awful lot of people took advantage of it. Marg Shuya said it took you up over the trees, so you could see Marean Lake. August 5th and 6th is The Greenwater Cove’s big weekend with all kinds of things happening - Farmers’ Market, a magician, public swimming, special smorgs, etc. and fireworks on the 5th. For August 12th, from 2 until 8, there is going to be a jam session at the Beach Café with bands from all over participating. Then there are fireworks later in the evening.